So what’s all the fuss about accent chairs? If your living room includes a couch, you’re good to go, right? While accent chairs can provide useful and practical seating in many instances, they can also play a decorative role that can set the tone of the entire room. If you think of the extra depth an added spice can give to your favorite chili recipe, you’ll be coming close to what an accent chair can do for a space. Not only does it provide seating for guests, but it adds a little pizazz at the same time. An accent chair can be dramatic, warm and homey, iconic, sculptural or simply utilitarian. If you want to choose one that will complement your space, keep a few things in mind. An accent chair is the perfect place to bring the mood of your space to its fullest expression. If your room is formal, then by all means, pull out all the stops and opt for an elegantly traditional wingback chair. Don’t be afraid to play it for all it’s worth. 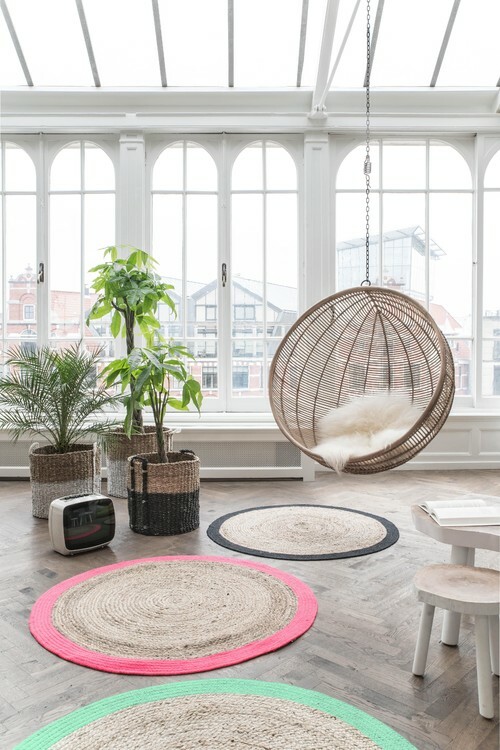 And if you are a minimalist looking to create a relaxed and playful, feel in your room, then why not do something really risky, like the swing chair above? This open and airy loft just wouldn’t feel the same without it. 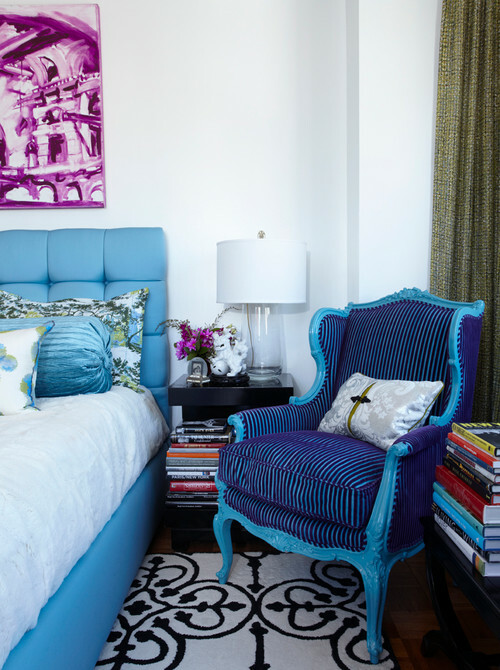 Are you afraid of color and pattern in your room? Afraid you’ll tire of a graphic black and white pattern or a brilliant magenta on a couch? Do you have a tendency always to gravitate to “greige?” The solution for you is an accent chair — but this time outfitted in the biggest, boldest color or pattern you can imagine. This is your opportunity to go completely off the deep end, into territory where you never thought you’d venture . Above, bold magenta chairs and a graphic black and white pattern on two wingbacks manage to look perfectly civilized, at the same time they are both bold and chic. 3) Do the exact opposite. Sometimes, you get the biggest impact by getting an accent chair that contrasts with the predominant style or theme of your room. If you’ve got a chic and modern living room, throw in an antique for some added interest. If you’ve gone traditional everywhere else, consider a modern accent chair. Two examples, are the chairs used in the dining spaces above and below. The mid-century modern Saarinen tulip chair is mixed with what seems to be similar to a traditional Shaker chair. Below, Kartell’s Louis ghost chairs are mixed with traditional Martin arm chairs. 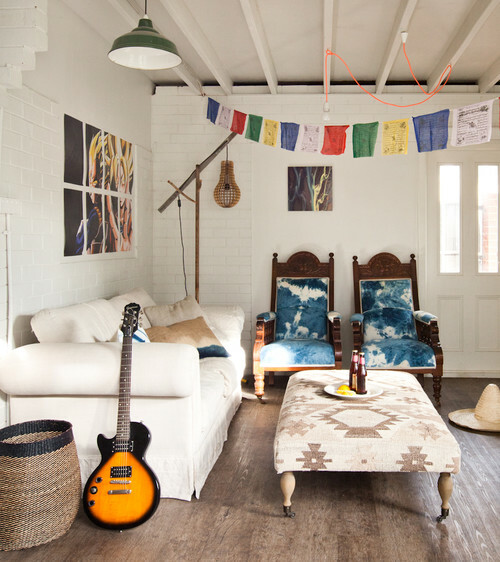 Eclecticism is hip. When mixing and matching the main thing to keep in mind to get it all to work is that the scale of the furniture should be roughly similar. Very low, sleek pieces may not work with large scale, heavy or tall pieces. 4) It’s your chance to be artsy. 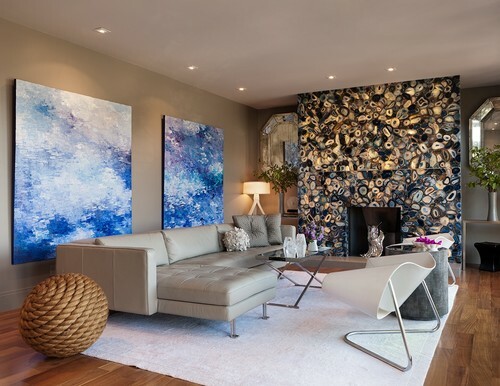 Are you looking for art for your place, but you don’t know where to begin? Begin with an accent chair! 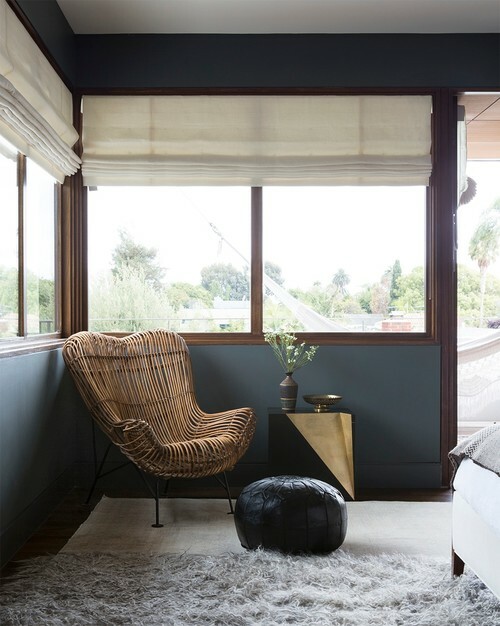 A chair can add interesting lines, texture and shape to your room in a pleasing but entirely non-threatening way. Any of the chairs below could help elevate your home the way that art can. The organic feel of the chair above would look perfect in a home featuring lots of African art. The sleek minimalist chair above would look great in a home with large, color field paintings. This eyecatching traditional chair outfitted in neon bright colors and patterns would look great in a home featuring lots of pop art or boldly modern figurative paintings and portraits — maybe Chuck Close or Andy Warhol. We can see this chair in a room filled with Western memorabilia and bold landscapes. And above, this chair can work in a room with large abstract canvases, as you see, but would also look good with pop art, or no art at all! The takeaway: adding an accent chair to your room is often a necessary and practical thing, but it’s also one area in which you can totally let loose, have fun, and step out of the box. 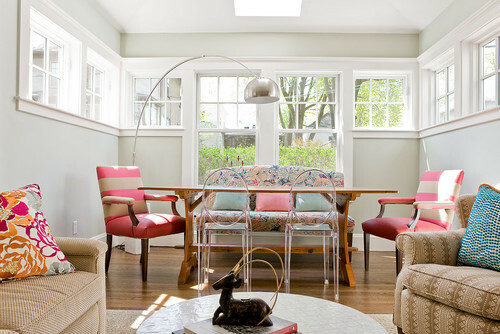 Give it a try and you will be amazed at how a simple chair can turn your room into a whole new space! This entry was posted on Tuesday, May 1st, 2018 by preynolds and is filed under Furniture. You can follow any responses to this entry through the RSS 2.0 feed. You can leave a comment.